To comparatively evaluate the prognostic or predictive value of ribonucleotide reductase M1 (RRM1) and excision repair cross-complementation 1 (ERCC1) gene expression in peripheral blood versus tumor tissue from patients with advanced non-small cell lung cancer (NSCLC) treated by gemcitabine/platinum chemotherapy. A total of 49 patients with advanced NSCLC receiving gemcitabine plus carboplatin chemotherapy were studied. RRM1 and ERCC1 mRNA levels in the peripheral blood and tumor tissue were determined by real-time fluorescent quantitative PCR. 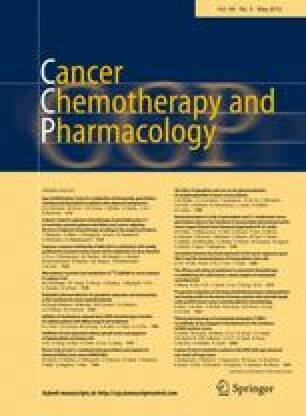 The relationships between gene expression and clinical and pathological factors, response to chemotherapy as well as prognosis, were evaluated. RRM1 expression in peripheral blood and tumor tissue, but not ERCC1 expression, was found to be positively correlated (r = 0.332, 0.258; P = 0.020, 0.073; respectively). RRM1 and ERCC1 expression levels were nearly synchronous in both peripheral blood (r = 0.351; P = 0.013) and tumor tissue (r = 0.634; P < 0.001). Neither was correlated with clinical and pathological factors. Patients with low RRM1 expression in peripheral blood or low RRM1 or ERCC1 expression in tumor tissue experienced better response to chemotherapy (50.0 vs. 16.0%, 50.0 vs. 16.0%, and 54.2 vs. 12.0%; P = 0.012, 0.012, and 0.003; respectively), longer median survival (18.5 vs. 13.0 months, 18.5 vs. 12.0 months, and 19.8 vs. 12.5 months; P = 0.043, 0.014 and 0.007; respectively), and longer progression-free survival (6.0 vs. 4.0 months, 7.8 vs. 3.9 months, and 5.8 vs. 3.8 months; P = 0.044, 0.016, and 0.008; respectively). Cox multivariate regression analysis showed that ERCC1 expression in tumor tissue was independent indicator for overall survival. Advanced NSCLC patients with low RRM1 mRNA expression both in peripheral blood and in tumor tissue could benefit from gemcitabine/carboplatin chemotherapy. ERCC1 mRNA expression in tumor tissue may be a predictive and prognostic indicator in advanced NSCLC patients receiving gemcitabine/carboplatin chemotherapy. This work is supported by the Science and Technology Planning Project of Zhejiang Province (No. 2009C33165), the Medical Science Research Fund Scheme of Zhejiang Province (No. 2008A060), and the Chinese Medicine General Research Program of Zhejiang Province (2009CA061).